This guide will walk you through the configuration of tax in J2Store for EU stores. This is an example configuration for stores in Europe. For detailed information on tax, please consult an expert. Important: No guarantee is offered with respect to any of the information given here. Please contact an expert before you take any decisions about tax matters. The example assumes you have a store in Germany and you charge 19% tax on the goods. All customers coming originating from Germany are charged with 19 % of tax. J2Store uses Joomla articles as products. So go to Article Manager and create a New Article / Product (If you sue any other catalog source like Zoo or Sebold, you should head there). Product creation steps are explained under the topic Products. 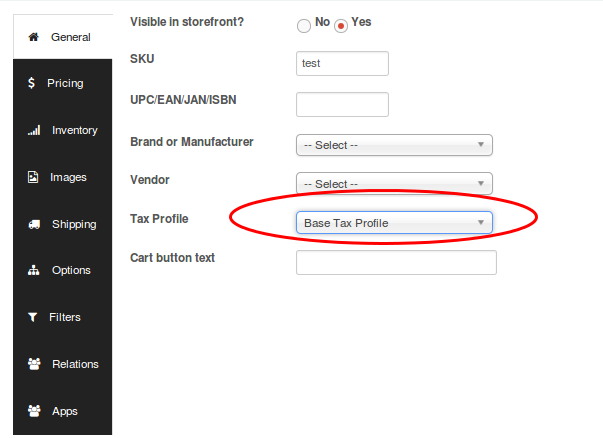 IMPORTANT: If you do not choose the tax profile, then tax will not apply in the store front. Charge the same VAT rate for customers from certain countriesIn this case, you will just have to open the Base Geozone and add the countries / zones to which you want to charge 19%. Then all customers from all those countries will be charged with the 19% tax rate. Charge different VAT rate for customers from certain countriesLet us say, you want to charge 12% tax for customers from Switzerland and France. Create a new Geozone and include Switzerland and France. Create a new tax rate and set the tax percent to 12%Go to Localisation -> Tax Profiles -> Open Base tax profiles.Under Tax rules, Click add, Choose your New tax rate and associate it to the Shipping address.Save. Now customer from Switzerland and France will be charged with 12 % of tax instead of your base rate of 19 %.